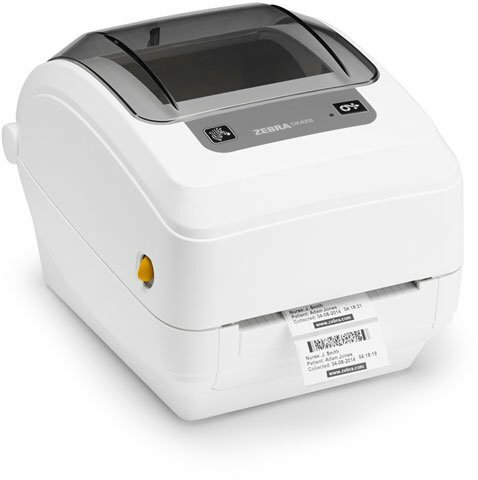 Zebra GK420t Health care - Thermal transfer Printer, 4" Print width, 203 dpi, USB/Ethernet Interfaces, Health care Plastic Case and Medical Grade Power supply. Cables sold separately. Designed specifically for health care applications, the GK420 Health care desktop printers are constructed using disinfectant-ready plastics to help clinicians safeguard patient health. As a thermal transfer printer, the GK420t Health care printer produces labels that are extremely durable. Ideal for printing long-lasting laboratory and asset-tracking labels that may be subject to harsh cleaning products, sterilization or temperature extremes. The Zebra GK4H-102210-000 is also known as ZEB-GK4H102210000	or GK4H102210000	.